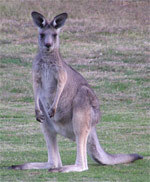 The Boulder Petting Zoo's Kandy The Kangaroo is starting to take kid's money and putting it in her pocket. BOULDER - The owner of Boulder's Noah's Ark Petting Zoo has told local authorities that the marijuana smoke in the air is starting to make his petting zoo animals act very strange. Emerson Danube, 43, stated that before the air was filled with the smell of marijuana his animals all enjoyed being petted by the children who visited the petting zoo. But he has noted that since January 1, 2014, when the new marijuana law went into effect his animals are so freaking confused that they are now beginning to pet the kids. Danube noted that it scares the heck out of some of the very young petting zoo goers since they think that the little fawn or the little piglet is going to attack them. He has talked to a local animal therapist about this problem and he was told that it is just the way things are going to be now that the aroma of pot fills the Colorado sky. STORY UPDATE: Emerson Danube has said that he is going to be issuing helmets to each child who visits his petting zoo. The helmets will be provided free of charge and they can be dropped off at the entrance booth as they leave the petting zoo.